HARVEY EDWIN Harvey passed away peacefully in his sleep on April 1st 2019. He was the dearly beloved husband and best friend of Margaret. 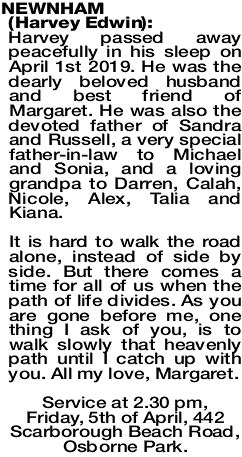 He was also the devoted father of Sandra and Russell, a very special father-in-law to Michael and Sonia, and a loving grandpa to Darren, Calah, Nicole, Alex, Talia and Kiana. It is hard to walk the road alone, instead of side by side. But there comes a time for all of us when the path of life divides. As you are gone before me, one thing I ask of you, is to walk slowly that heavenly path until I catch up with you. All my love, Margaret. Service at 2.30 pm, Friday, 5th of April, 442 Scarborough Beach Road, Osborne Park.